South Jakarta Industry and Energy (PE) Sub-dept. targets to finish installing streetlights (PJU) on Transjakarta Corridor 13 Ciledug-Tendean route on June 20.
" Our target is to install all PJUs before Jakarta anniversary"
This is done to light this flyover concept corridor area especially on June 22 which is the Jakarta's 491st Anniversary. South Jakarta PE Sub-dept. Head, Suryanto said, his side will install at least 341 streetlights along this flyover which length is more than 9 kilometers. "Our target is to install all PJUs before Jakarta anniversary. We want to give this present for Jakarta," he conveyed, Tuesday (6/5). 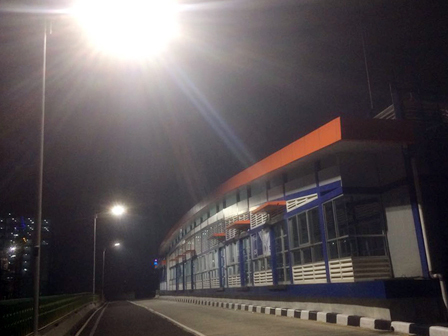 He explained, his side install PJU lamps every night after Transjakarta bus corridor 13 finished operating. It means his side only have five hours a day to install these streetlights. "Our problem is installation time. Because we start to install it after Transjakarta finished its operation around 11 PM," he mentioned. But he ensures to finish streetlights installation according to target. His side has asked the contractors to optimize the existing workers considering their working days will be cut due to Eid holidays. "We have committed to finish it as target. We ask the provider to optimize its workers," he stated.